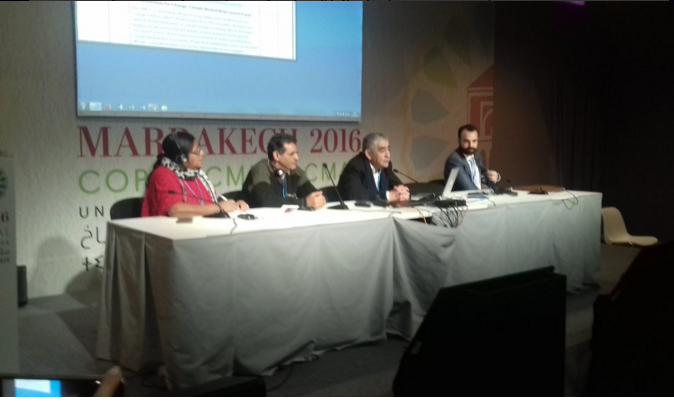 The Indigenous Peoples Caucus reiterated their consensus position to the President of COP22, Moroccan Foreign Minister Salaheddine Mezouar at the meeting of the Indigenous Caucus this morning. Hamza Tber, Chief of Staff, Multilateral Negotiations, Kingdom of Morocco accompanied the COP President at the Caucus. - An incremental approach led by the SBTA chair and a representative of Indigenous Peoples appointed by the Indigenous Peoples themselves who will serve as co-facilitators. - Invite submissions by parties, Indigenous Peoples and observers by 31 March 2017 on the purpose, content and structure of the indigenous peoples´ platform to inform the dialogue and the process. - Convene 3 consultations, to be conducted by the co-facilitators during May sessions on the operationalization of the platform, including purpose, content and structure. - Request the co-facilitators to present the outcomes of the consultations for the consideration and adoption at the COP23. - Request the secretariat, under the guidance of the co-facilitators, to operationalize the platform taking into account the submissions and the outcomes of this dialogue.